On 9/12/2017 they upgraded their channel and move all their films to https://www.youtube.com/c/BurningEarthProductions. All links below need to be updated. An animation whose first episodes use titles for words and no people. However, it did not lack a story, even then! Episodes 4 and 5 will include human animations of the crew, with the avatars modeled after real voice actors from around the world. Released three prequel prose stories over 2012. Silver Age. Enterprise is the NCC 1701-E There is music, and there are words in titles, but no voices and no people animated. This technically does qualify as a film because the pictures move if that is the filmmaker's intent. There is clearly a story. 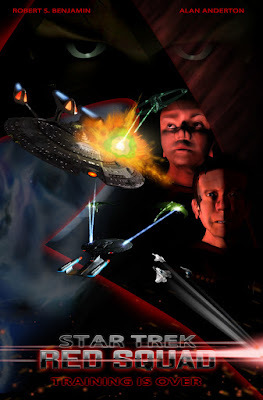 The filmmaker also has shorts entitled "Star Trek Valkyrie" and "Star Trek Pegasus" on his You Tube home page, as well as many other trailers and teasers and tests for Red Squad. We, of course, look forward to each adventure! On July 5, 2016, Star Trek Red Squad was suspended indefinitely. The CBS Guidelines were cited. Chris also worked on another project, but it was not clear as of March 21, 2015, if it was going forward. He failed to respond to my facebook post of January 15, 2015. Star Trek Begins. On August 5, 2015, I discussed this with Chris Kroznuski, and he said this was on long term hold, and possibly abandoned. He didn't know when, or if, he would get back to this project. I am leaving my earlier notes here, for anyone who remains interested in its history. Robert April commands the USS Enterprise before Pike. Live Action Fan series; Adult fans, sets, costumes. Set in the JJAbrams timeline, but before the bulk of his movie, "Star Trek" take place. (North Carolina). Working January 2013. In December 2013, they announced casting children to play young Jim Kirk and young Gary Mitchel in a short film to be filmed in late January 2014. Pictures of the shoot with Klingons were posted in late March 2014. Also, it appears that they are using the Farragut Films studios. Thanks for supporting Red Squad!